The East Village is full of things to do and see, including some astounding architecturally interesting buildings. 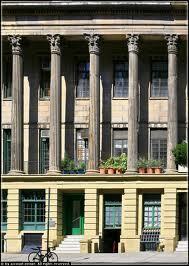 At one site, known as Colonnade Row, there are four Green Revival mansions which were built in 1833. There were originally nine homes along this stretch of Lafayatte Street between Astor Place and East 4th Street, but the four remaining are enough to get a good feel for the elegance along this formerly exclusive strip. The stonework on the buildings was done by inmates of the famous Sing Sing prison, and the once elegant (now a bit shabbier) buildings were home to the likes of John Jacob Astor and Cornelius Vanderbilt. Now these buildings serve as the homes of apartments, a lounge and a restaurant.